1. Very gently fry the strips of lemon peel in the olive oil over a medium-low heat for 5 minutes to infuse, then strain and allow to cool. 2. Fry the watercress in the butter until wilted then season generously and blend it with the heavy cream. 3. Return the blended mixture to a pan to keep warm. 4. Season the flour generously with sea salt and black pepper then dredge the baby squid lightly in the flour. 5. Shallow-fry them in oil over a high heat until crisp and golden, then place on kitchen towel to remove excess oil. 6. 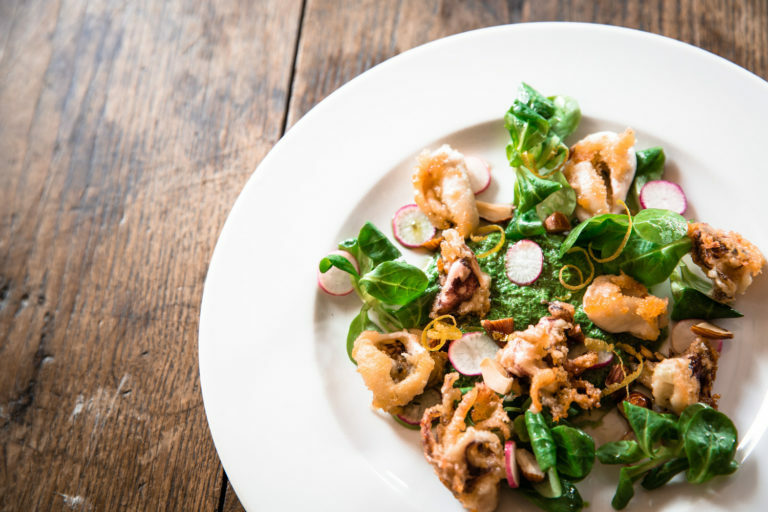 Serve the squid on a base of watercress sauce, with a little watercress or lamb’s lettuce, sliced radishes, almonds, and a drizzle of lemon oil.